Simon Long basically collated as much information as was available on the web for the VCP4 exam, and has since continued updating the links on his page to point to the documentation for vSphere 4.1. 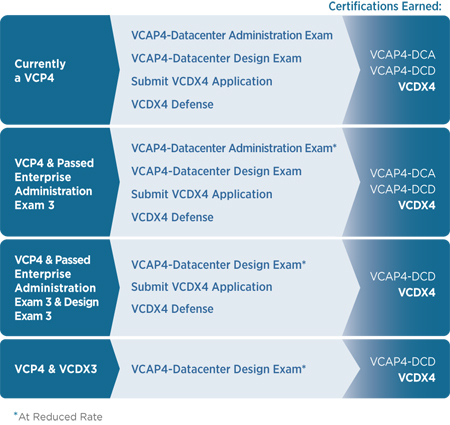 Simon has also started working on a VCAP-DCA. – a collection of links to the key technologies and documents covered in the exam. It’s a pretty complete guide to what to study for these exams. Lastly, Scott Vessey over at http://vmwaretraining.blogspot.com/ has created a blog post of beta exam review links (in additiona to all the other very useful resources that he normally churns up). These three guys are all VERY active on the VM forums and really have brought a whole lot to the community. Please make sure to share anything new that you do find with them, and thanks them for their hard work.